Many eyebrows raised in consequence of Tweet from Sara Huckabee-Sanders's Twitter account; explanation was soon forthcoming. White House deputy secretary Sarah Huckabee-Sanders broadcast over the weekend a curious Tweet that raised quite a few eyebrows and speculations on the social network that is particularly popular with the current US administration. 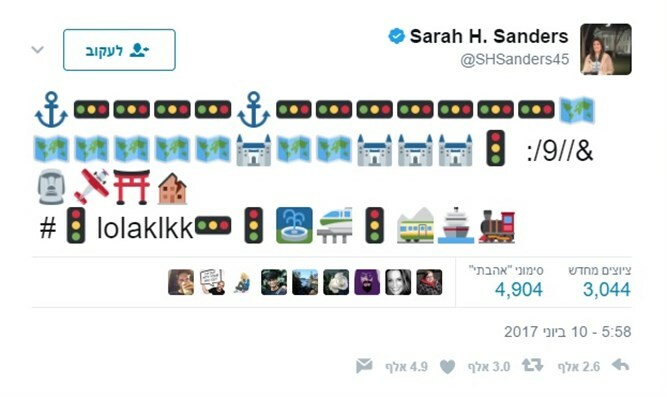 The Tweet contained a stream of unintelligible post-modern hieroglyphics: Traffic lights, ship anchors, palaces, airplanes, and more. Surfers reacted with curiosity and thousands of people retweeted the unusual message. Half an hour later, the White House deputy spokeswoman explained the meaning of the Tweet and said, "This is what happens when your 3 year old steals your phone. Thanks Huck!" She finished the Tweet with the Hashtag: #neverleaveyourphoneunlocked.